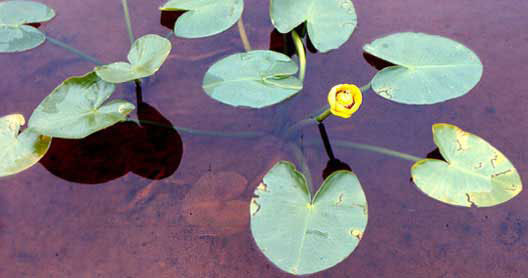 The Yellow Pond-lily is a beautiful plant whose floating leaves dot the surface of many small lakes and ponds throughout the province. Robert Cannings. British Columbia is shaped and given life by water – it feeds the soil, the glaciers, creeks, rivers, lakes and marshes that nourish life of all kinds. This is a photograph of the brown cylindrical flower heads of the Common Cattail, with a tiger moth larva crawling on it. This is a photograph of a red, Cardinal Meadowhawk dragonfly. This is a photograph of Mayfly larvae. This is a photograph of spawned-out Sockeye and Chinook Salmon in the shallows of the Adams River. This is a photograph of the Northern Wood Frog. This is a photograph of a Yellow-headed Blackbird.